We love us some DOMA coffee and, evidently, so do you. Recently we made the trek to the tundras of Post Falls to see if the quality of the coffee really is a result of the magic happening behind the scenes. In short, it is. 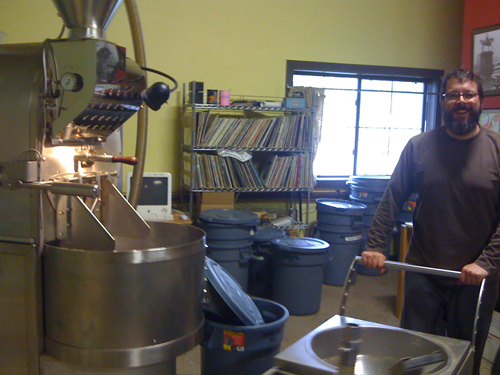 This is a roaster that actually will trade you coffee for vinyl records, so of course it is. When you see the passion the boys and girls at DOMA have for their products, everything just adds up perfectly. Everybody is into the "free trade" and "organic" these days, though those words are becoming more and more hollow. You can easily circumvent the system and stamp the labels on on your products to make good business if you know how to play the game. DOMA, meanwhile, really does make longterm commitment to their farmers, and strive to work with them on a very personal level. To me, it seems that the quality of DOMA's coffee is tied to the personal care, all the way from making good and fair business with the farmers, to the way of the roasting. As a consumer it is a care you probably should expect, or at least want, but it's a rarity to see it executed as well as it is at DOMA. This all while their brains are churning for the future. There are other plans, many plans, still being formed, all that can be summed up this way: They all show an almost kidlike enthusiasm DOMA has for its coffee. Their product is a labor of love, and it is obvious that the company will keep evolving by improving their current processes while traveling down new avenues. When we stepped into their offices, we arrived in the middle of a barrista training session. Here the up and coming coffee shop workers were trained how to properly make espresso based drinks, while getting a good overview of DOMA as a company. It's a fairly intense training and it's what our little area needs more of. Coffee culture here consists largely of drive through coffee where milk and syrup is used to hide the flavor of the coffee. DOMA is doing its share to change that. That's why we like them, and that is likely why you picked them as the area's best roaster. There are other good local roasters, sure, but none as unique and, frankly, as good as DOMA.